Some big companies are cutting back their on-campus recruitment efforts in Europe, while online careers fairs have taken flight. MBA recruiters say Europe needs to catch up with the U.S.
Last Thursday afternoon, David Burke, the leader of Talent Acquisition at Infosys, had been summoned for a campus recruiting drive. It had been a busy few weeks for the talent scouts of the leading global technology company, full of candidate meetings and business school events. As a leader of the company’s recruiting efforts, David had been asked to come together with other top MBA procurers to assess London’s offering. The previous Thursday, reports filtered through the business school scene of the demise of on-campus recruiting. Although those reports may have proven to be overblown, the threat is real. Some big companies are cutting back their campus recruiting efforts. Many have cited the need for more targeted drives. Big banks have begun focusing on specific schools. For others, the recruitment agenda has been relentless and wide-ranging. Yet the business school world feels the need to raise the issue. Some European schools believe they have fallen foul to the economic crisis. “Most of the top recruiters have become more selective, so there has been a clear process of, in finance, the recruiters looking only for top [students] and concentrating the efforts only with a few kinds of partners,” says Professor Francesco Saita, Bocconi Graduate School's Dean. There is no suggestion that schools are intentionally cutting back their on-campus recruiting events. The b-school industry assumed this would level out as economies rebounded, but that has not been the case for every campus. The frustration, particularly for European careers officers, is that a lot of their MBAs may miss out on valuable face-to-face time with recruiters. 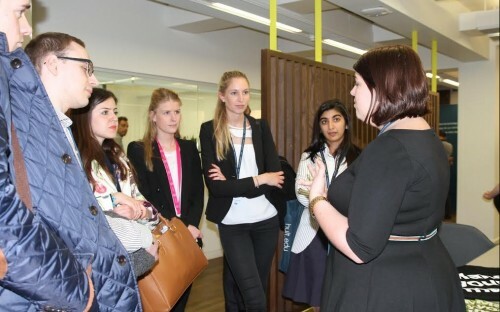 A recent London careers event, organized by Hult International Business School, saw 80 interviews scheduled with Hult students and recruiters. Jens Plinke, Head of Employer Branding for Henkel, said the campus event was a "key touch point" for the firm. Across all the school’s campuses, more than 500 face-to-face interviews took place. “I think our students are pretty happy about the ways that they are able to interact with companies,” says Alethea Sibois, senior director of Corporate Relations, Europe, at Hult. The benefit to students is obvious. “It was a one-stop-shop; presentations, interviews and the opportunity to speak to the employers directly,” says Kendra Scanlon, a Hult MBA student. In February, 400 MBA students flocked to the Association of MBAs (AMBA) London careers fair. Sixteen top recruiters pitched their companies. Laura Sawyer, Global Head of Consulting Recruiting at Gartner, the leading I.T, research and advisory company, said the event was a “critical” part of the firm’s recruiting calendar. Andrew Main Wilson, AMBA's Chief Executive, said: “The quality and salary of job offers received on graduation are increasingly becoming key criteria in students' selection of business schools." School insiders have expressed concern over a lack of recruiting opportunities in the UK – particularly for international students. Top recruiters have said Europe needs to up its game. Gartner plans to hire MBAs for sales, business development and consulting roles this year. Marie says an on-campus presence is important for brand awareness. The firm uses a representative from Hult to bring in potential candidates. “At this level, it’s amazing for our progression,” she says. Big banks, which cite the financial crisis as a stranglehold on recruitment, focus on a handful of schools. J.P. Morgan recently stopped recruiting from campuses in EMEA for its investment bank. The effects have coincided with a huge drop in European MBAs moving into investment banking. One MBA recruiter at a leading bank says they have seen a drop in applications, as the firm faces big reputational challenges. “We need to focus on fewer events, fewer universities and go back to the places where you know you can have a big impact, and are more likely to find more talent,” says Roberto Rossi, HR Manager of EMEA, non-UK, at Morgan Stanley. It is thought that American business schools have a different recruiting mentality. But European schools have to improve their physical recruiting efforts, says Gartner recruiter Marie. “It’s become more difficult; more people go to university; it’s more challenging; the pay isn’t there… so if we were adapting to the same kind of culture from America over here, it would be more beneficial,” she deadpans. Technology companies may be at the forefront of the campus recruiting effort this year. Infosys have invested “quite a lot” in a greater campus presence, says Julia McDonald, Infosys’s head of talent acquisition, EMEA. The company’s talent scouts attend careers fairs in London. Steven Upstone, the CEO and founder of Loop Me, the social mobile advertiser, says: “Nothing beats meeting people face-to-face. We travel to a lot of conferences globally, to meet large groups of people. Face-to-face is critical." He has hired three Hult graduates, and plans to hire ten new employees over the next four months. Meanwhile, companies in other sectors are pulling out of campuses altogether. Virtual careers fairs have cropped up, as employers are bringing the job-search process online. Booz Allen Hamilton Holding Corp is moving the initial stages of its student recruiting online. The firm now uses Twitter chats, school-specific webinars and even Instagram and Vine videos. In the U.S, the University of Maryland’s Smith School of Business hosted its second virtual career fair earlier this spring. They signed up 300 students and 11 companies took part. This month, tech company Collegefeed will host a digital career fair for students at Carnegie Mellon University. Nearly 40 companies have signed up so far. Some schools have teamed up with CareerEco, a virtual career fairs provider. Between 50 and 100 employers host online chat rooms, at designated times. Up to 5,000 students connect at each fair. Yet it is understood that business schools are still trying to ramp-up on-campus events. Many schools, in both the U.S and Europe, are still attracting some recruiters. But Europe may need to catch-up, agrees Julia from Infosys.